Culms: Slender, erect or ascending, hollow, flattened near base, glabrous to scabrous. Blades: Basal and cauline, arched or spreading; blades elongate, 6 to 20 inches long, .2 to .5 inch wide, flat or slightly folded lengthwise, mid-vein prominent, glabrous to sparsely pubescent, densely pubescent near base on upper surface, margins often ciliate. Sheaths: Mostly longer than internodes, mostly keeled, glabrous or sparsely pilose. Inflorescences: Panicles, terminal or axillary, 6 to 16 inches, open, branches ascending or spreading, re-branching, ultimate branchlets mostly appressed, appearing somewhat one-sided. Spikelets: Spikelets oriented in 2 rows, bent obliquely on short pedicels, narrowly elliptic-ovate, .1 to .15 inch long, sharply pointed; glumes unequal, awnless; lower glume 1/3 to 1/2 length of spikelet, ovate, .04 to .08 inch, keeled, 3-5-nerved, glabrous, tip bluntly to sharply pointed; upper glume narrowly elliptic-ovate, .09 to .14 inch, 5- or 7-nerved, tip acuminate; lowermost lemma usually sterile, narrowly elliptic-ovate, 5-nerved; fertile lemma narrowly oblong-elliptic, bluntly pointed; palea with minute tuft of hairs at tip. Habitat: Low moist areas, ditches, stream banks, roadsides, marsh borders; prefers shade. 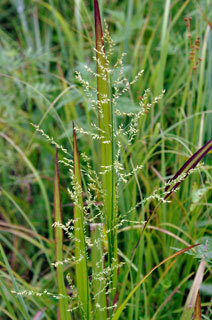 Forage Value: Beaked panicum has good grazing value for cattle and horses, but is rarely abundant. Uses: Upland birds and waterfowl eat the seeds. Comments: Forms dense clumps from long, creeping rhizomes.